It’s been quite awhile since I last posted a show & tell, therefore that’s how I’ll start this new year! One of my very favorite things to do in the kitchen is bread baking. Many years ago, I discovered crusty, tangy sourdough bread tickles my taste-buds. That’s right! In fact, just thinking about a warm loaf fresh from the oven has me salivating! Seriously, I do not exaggerate! My sourdough starter is several years old, and I started it with no store bought yeast. Did you know there is natural occurring yeast in the air around us? I’m no scientist so I really don’t understand how it all works, but to grow a sourdough starter one only needs water, flour, air, and patience. There seems to be a rising number of people swearing off gluten whether they have a sensitivity to gluten or not. That would never go over well with my husband/wheat farmer/lover of bread. However, I’ve read many reports that bread made with long fermentation is much easier to digest. Why? During a long fermentation, the proteins begin to break down making it much easier to digest. I cannot tell you from personal experience how much difference this really makes since I don’t have any sensitivity to gluten. I will also caution that most store bought sourdough bread has most likely not had a long fermentation. To begin my bread making, I retrieve my starter from the refrigerator, feed it, and let it sit on the counter several hours until it gets bubbly. When it has expanded to almost fill my jar, it’s time to make the dough. When my dough is mixed, then I put in a large covered bowl or jar for the long fermentation. I like to let it sit and do it’s thing over night. These beauties greeted me in the morning! It’s time to dump out the dough and make the loaves. I made two different breads. The round loaves are oat and molasses, and the formed loaves are cinnamon spiral. The loaves need scored to allow a weak area for steam to release during baking otherwise the loaf may crack. As you can see, I used two different scoring techniques. After scoring, the loaves are covered and allowed to rise until almost double in size. Then it is time to bake. Sourdough baking is not a fast task. Time and patience makes the best loaves. This is all too similar to one’s maturity. It is through practice and experience, trial and error, faith and devotion that enables one to grow. It’s time for another show and tell. Have you had an item that showed scars from wear and tear? What did you do with it; throw it out? I have had a couple folding chairs hiding in the closet. They were actually received as a wedding gift and have been used A-Lot. It got to the point that the years of use had scarred them so much, that I didn’t even get them out to use anymore. I didn’t want to throw them away though because structurally they were in great shape. 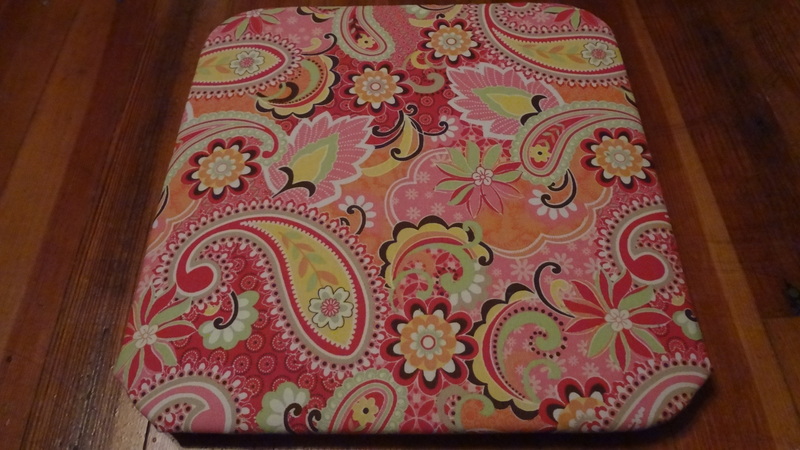 It is amazing what a can of spray paint and a bit of fabric can do. Sorry, I forgot to take a before picture, but I have pics of the process and completion. 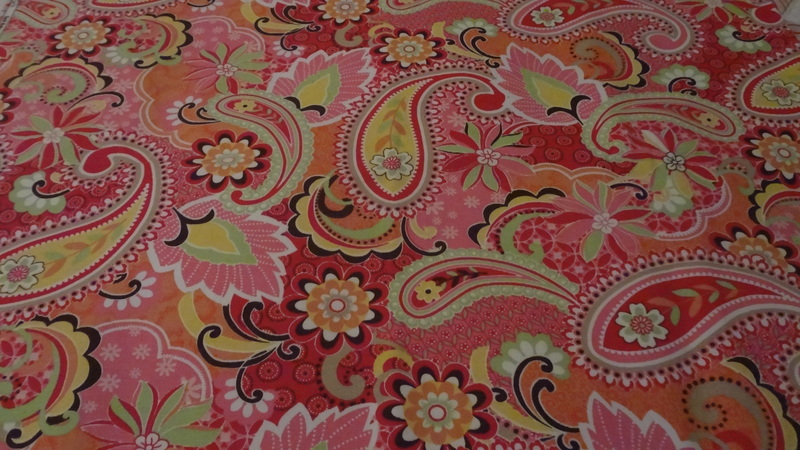 I saw this bright, fun fabric and couldn’t resist. These colors don’t go with my house decor at all, but they will be a bright spot on my patio when I have guests and need extra seating. The first thing I did was take the seat off. Then I took the frame outside and gave it a good coat of paint. Have you seen all the fun colors of spray paint? 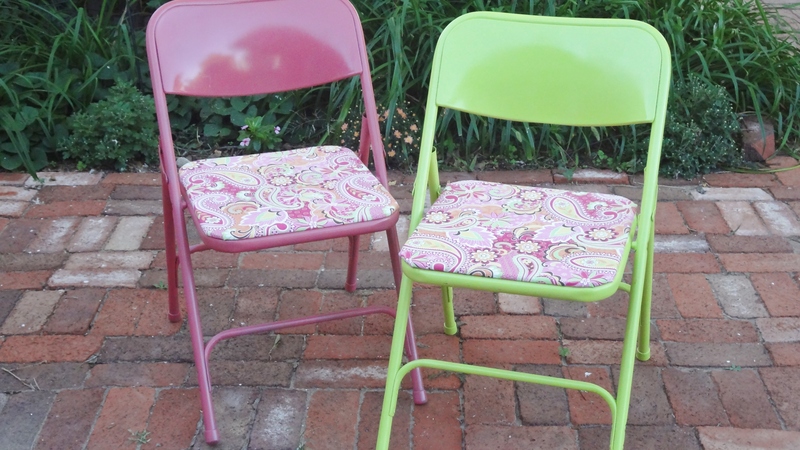 I chose watermelon pink and key lime for my two chairs. These were colors I pulled from the fabric print. While the chairs dried, I recovered the seats. I ran a bead of hot glue along the edges to hold the fabric tight and in place. Then I turned the edges under and stapled in place. The rounded corners were a little tricky, but I just made a couple tucks. By the time I finished the seats, the paint was dry and ready to reassemble. 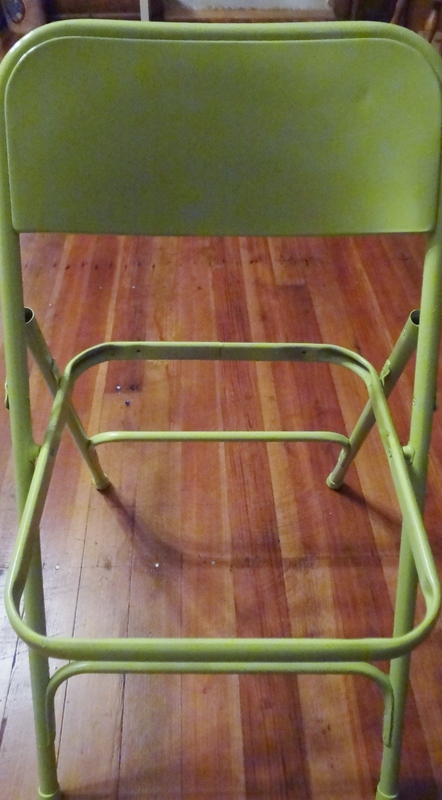 This was one of the quickest makeovers I’ve done, and I am so very glad I didn’t discard those old folding chairs. Yes, God is most definitely still workin’ on me! It has been a while since my last show and tell, so on this Saturday morning that is what I’ll do. First, I have a question for you. What do you do on a summer afternoon when the temps are in triple digits? I was working outside yesterday afternoon, and really didn’t mind the heat too much. Of course, the Kansas breeze (or wind depending on where you live) keeps the air moving so it feels much different than ninety degrees, calm and 100% humidity. I have a patch of bamboo. I really don’t know what type of bamboo it is, because I got a start from a friend close to twenty years ago. It grows tall and green, is drought tolerant, and spreads. This spreading could be a problem in some areas where there is a lot of moisture, but I have not had any problems with it being invasive in our dry locale. 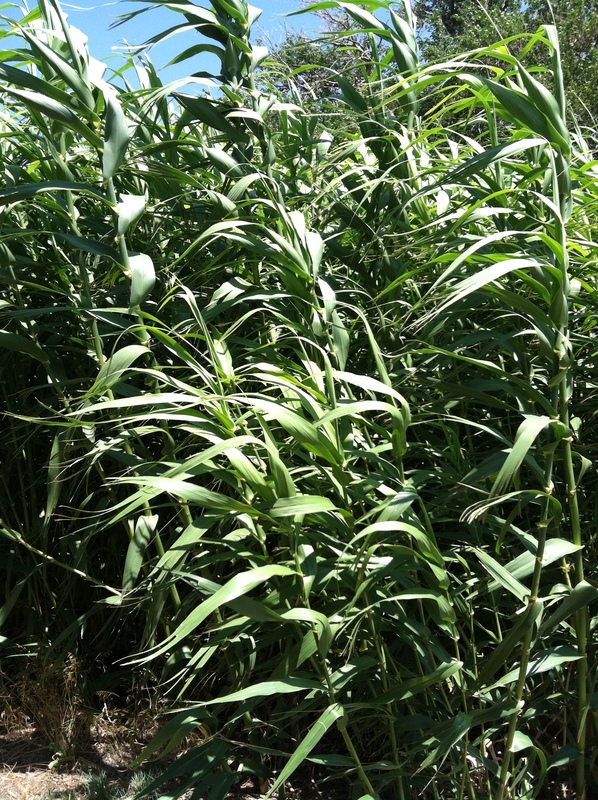 I very seldom water it, yet it still gets lush and about 12 feet tall, with big bushy plumes in the fall. 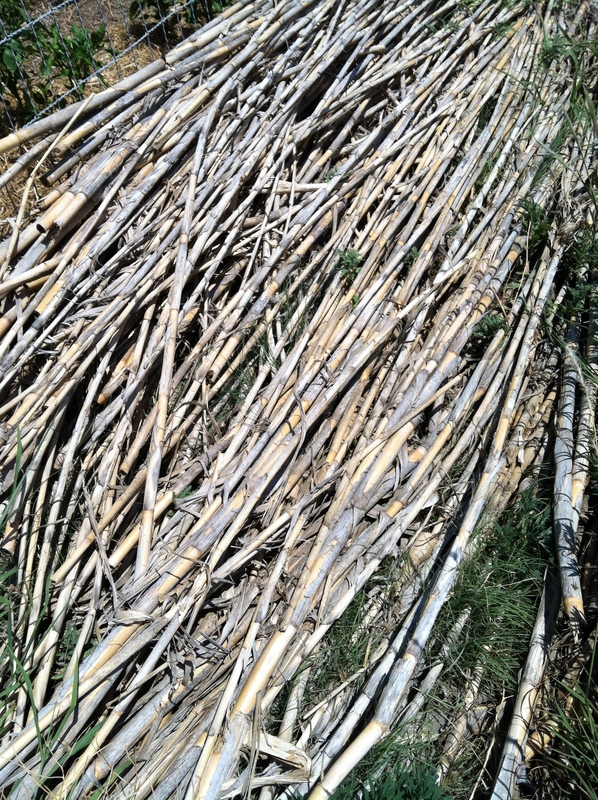 In the winter, this bamboo dies back so it can grow knew stalks in spring. Some people let the dried stalks stand, but I don’t like the straggly look when the new growth comes up. Instead, I cut them off. A chain saw makes quick work of them. The first couple years, I threw the pile over the alley fence, and they are still there! They do not decompose quickly at all. So then I started hauling them to the brush pile in the pasture. They seem to make a great protective habitat for many critters. The beginning of May, we cut the old stalks off , and they’ve been piled since. A few years ago, Hubby bought a small, portable wood chipper. It is not made for heavy duty tree branches, but works great for shrub clippings and such. Yesterday, Hubby graciously started the chipper for me. I am neither strong enough nor tall enough to get enough leverage on the pull rope to crank the engine. Besides, it makes him feel special to know I need him. 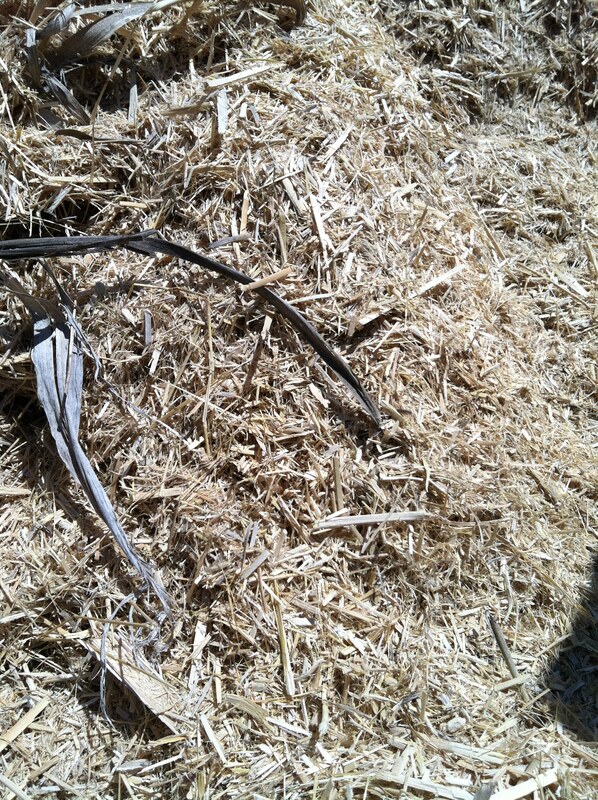 😉 I quickly went to work turning the pile of bamboo into chips to use for mulch. Although it was hot, I did not mind the work at all. It really was not a difficult job, and I was excited about the growing mound. Today, I’ll cart it to the yard and spread it under some young trees. I ended up with 4 bags of free mulch. All it took was a little time and a bit of sweat. What project are you working on? My next one will be on the patio. Check back to see what it is. It’s done; it’s done!!! AND I love it! Oh! You wonder what this excitement is all about? Well, I’m glad you stopped by for today’s “Show and Tell”. You see, I love to sew and craft and scrapbook and well, be creative. 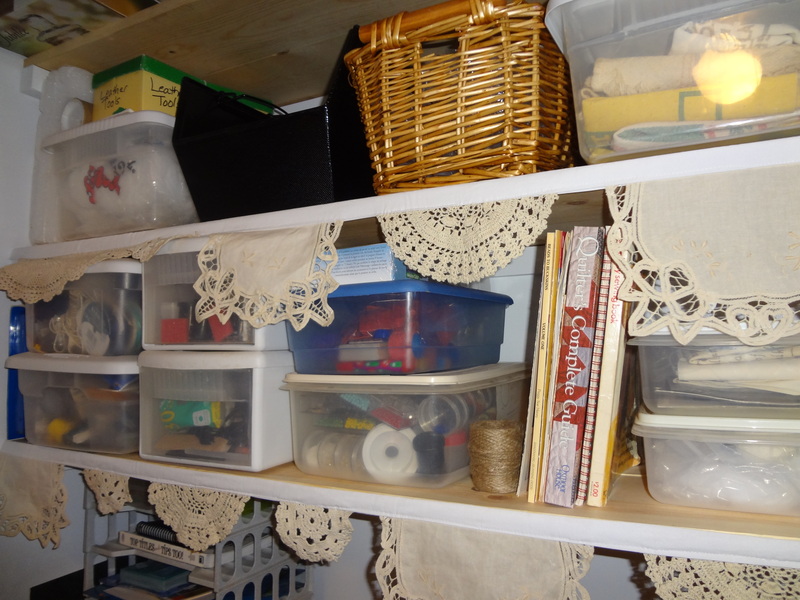 However, I have not had a very functional space to keep supplies and to make things. That is until now. 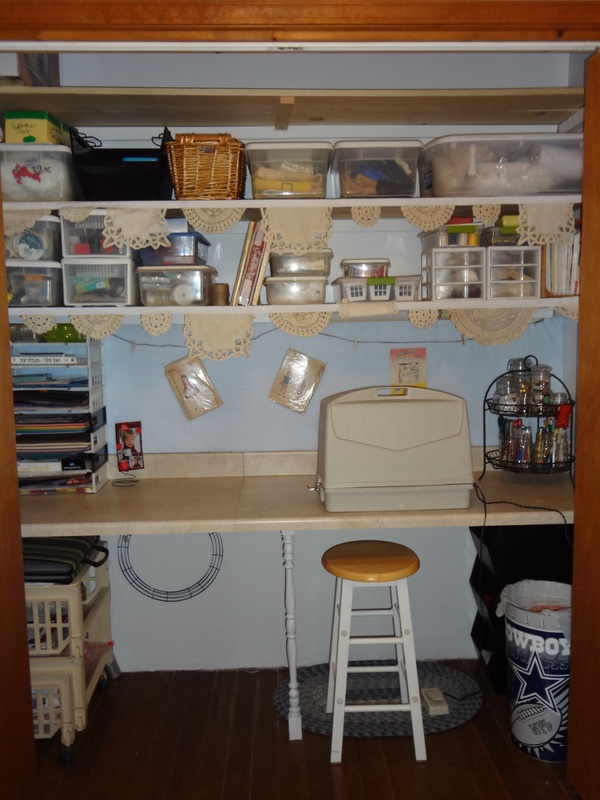 I (along with some much appreciated help from Hubby) just transformed a bedroom closet into a very organized and functional sewing/crafts/scrapbooking center! Finally, I have everything at my fingertips with workspace included! Oh dear, I’m getting way ahead of myself! Let me just give you a step-by-step of this transformation. This closet with double bi-fold doors had a wire closet organizer. 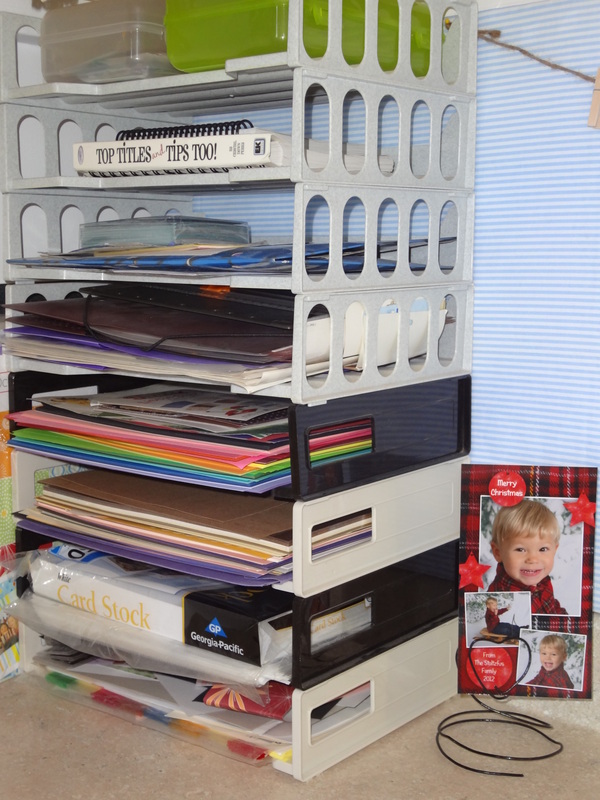 We removed the organizer and plan on using it in a different closet. 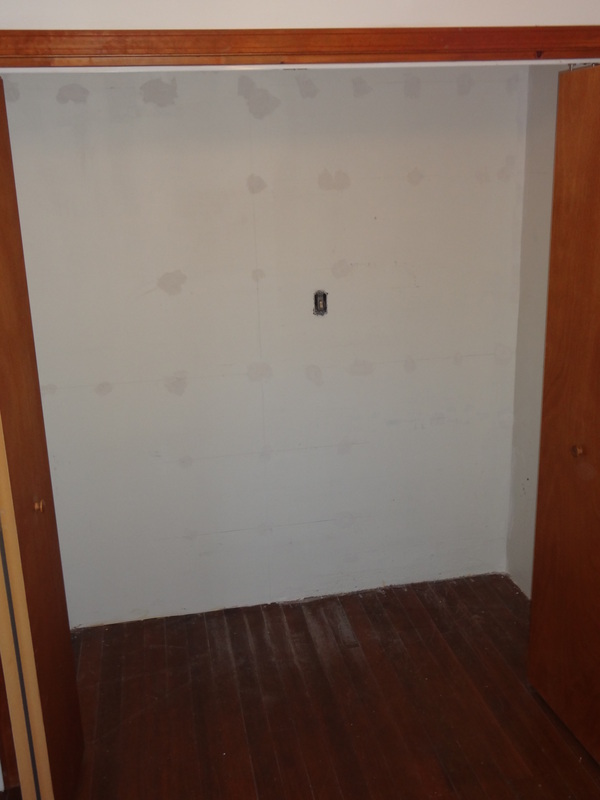 This left holes in the wall, so I patched them and repainted the walls and ceiling. It was important to keep it as light as possible for my workspace. I did not have to buy paint because I had enough left from a different project. 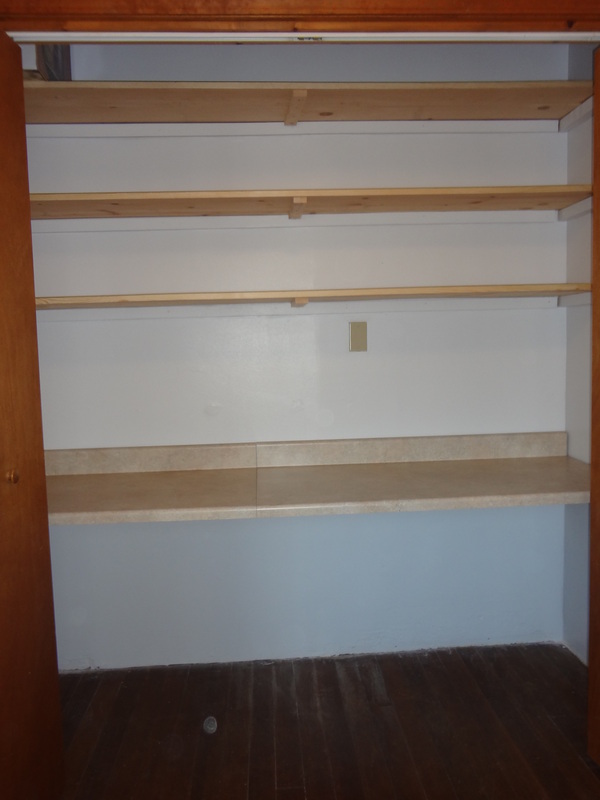 Next was shelving and work table. This was really my only expense! I was able to find formica counters on sale. This was my area to splurge as I wanted a smooth surface to eliminate snagging fabric and also easy cleanup for glue or paint. Once the counter was installed, I decided it really needed some kind of additional support in the middle. Years ago, we removed a banister railing from the family room saving the spindles for re-purposing. The spindle fit perfectly! I painted with the same paint used for the walls and then distressed it a bit. The stool fits perfectly under the counter and is just the right height. I had bought it when the boys were young for our hair cutting stool. They are grown and gone, and now the stool has a new home and use. 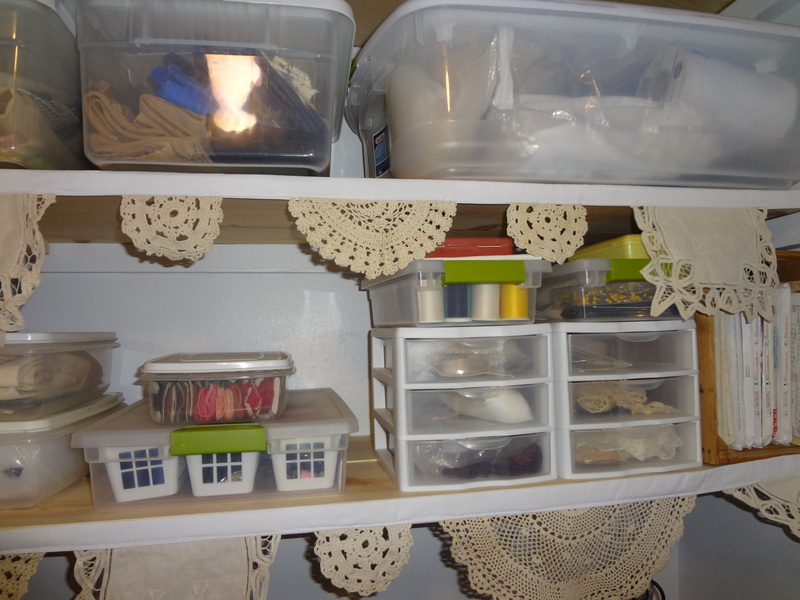 I function best when things are organized, so how did I organize sewing, crafts and scrapbook materials? On the left end of the counter is all my scrapbook supplies. They are easily accessible and I have plenty of counter to work on. Above the tray stackers are my craft items. I used a wire pie server and jars to help keep odds and ends corralled. 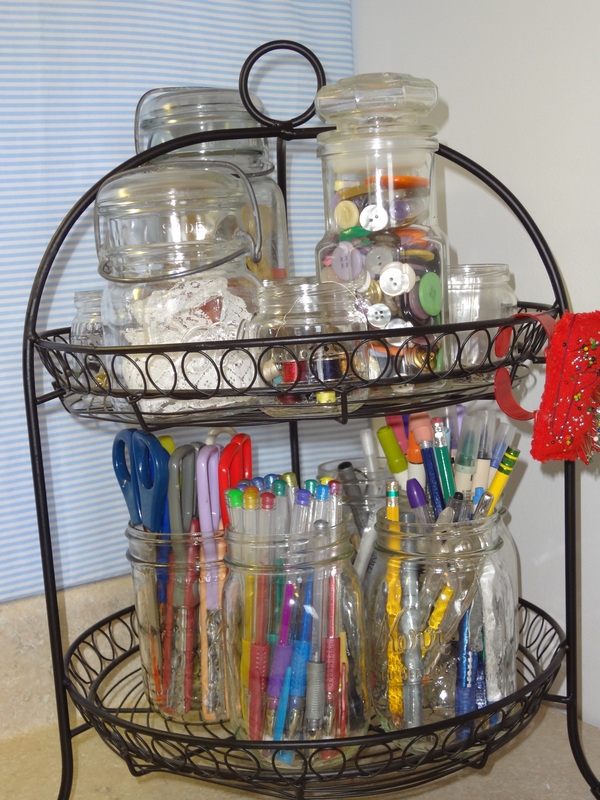 On the top rack are items for sewing and the bottom is craft pens and scissors. This can easily be moved from one end or the other of the counter depending on the project I’m working on. The jars can also quickly and easily be removed to use the wire server as it was originally intended. Oh! I almost forgot – my idea board. I found a fabric remnant in my stash that was just the right size to cover a piece of styrofoam insulation. The foam was cut to fit the wall between the counter and bottom of first shelf support. The blue ties into the bedroom colors, and teamed with white stripes keeps things light. 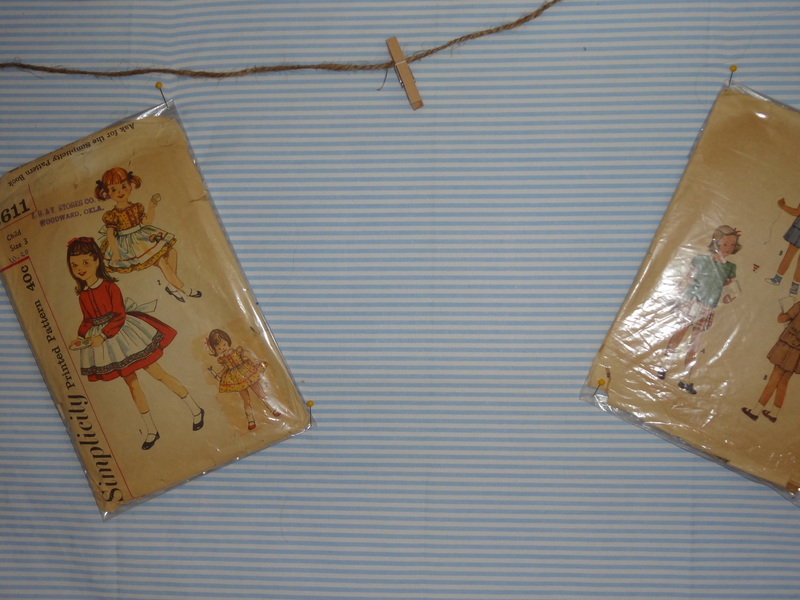 I can use push pins to attach project ideas or supply snippets, or I can clip with mini clothespins onto the jute rope. This work center did need some additional light. I relocated an under counter light that was not being used and attached beneath the first shelf. For eye appeal and the finishing touch, I used the doily bunting I made for my daughter’s wedding. I used glue dots to attach bunting to the edge of the shelves. Who would have thought that a closet could be your favorite place to hangout? Well, while the winter weather is here, this is my new go-to space! This project came together quicker than I thought it might, so I’ve already had a few days to use it. I have been sewing, sewing, sewing.